Media plays a major role in the sales funnel, which from top to bottom, includes awareness, interest, decision and finally, action. But with the average consumer being exposed to about 30,000 messages daily, it can be hard to cut through the clutter. That’s why it’s important to understand all things media, including paid, earned, owned and shared, and use them in combination to drive the results you want. Paid media is advertising—paying to promote your products or services. It offers immediacy, scale and control. If not done well, however, it may simply add to the clutter, costing you money without much reward. Many businesses default to a “spray and pray” approach; they spend a lot of money on placement, but without a focused message and targeted buy. In addition, because anyone can buy an ad, paid advertising typically does not enhance a brand’s credibility. The three essential components of paid advertising are reach, frequency and message. Reach tells you how much of your target demographic you are reaching. Frequency tells you how often your target audience will be exposed to your ad. And of course, your message is what you are saying, and how you are saying it. Syndicated media measurements are best when calculating reach and frequency. It’s why we are one of the only agencies in the region to subscribe to the top sources for this information: Nielsen TV and Nielsen Audio. All too often, we see companies who buy the media they watch or listen to the most, even when they aren’t in their own target audience. 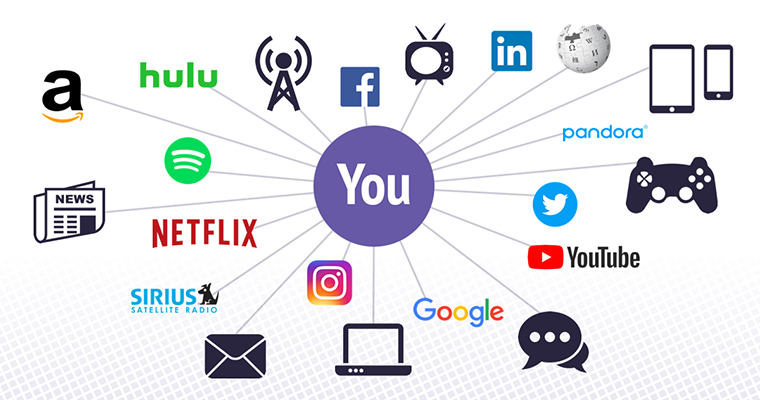 Syndicated media measurement allows us to home in on your demographic without personal bias, giving you the biggest bang for your advertising buck. Earned media is public relations. Through press releases, media alerts and media relations, our public relations specialists work to gain you media exposure in news segments, feature stories and bylined articles, positioning you as a thought leader in your field. And unlike advertising, there is no cost for the coverage—just time and effort. Done well, the result is a third party talking about your product, service or brand. This enhances your credibility and provides you with shareable content you can use on your website to enhance SEO. The challenge with earned media is that there is little control and no guarantee the media will share your message. That’s why partnering with an agency like Market Mentors, with a broad network of media connections, is beneficial. We know how to align your goals with the goals of the media to create a win-win situation for everyone. You likely already own some media, including your website, videos, collateral, blogs and case studies. These assets that you control can help you build long-term relationships with existing and potential clients. They offer longevity and the ability to reach niche audiences, and make great sales tools. Other forms of media can maximize the effectiveness or you owned media, which can be difficult to disseminate without the benefit of a plan. Also referred to as social media, shared media provides a personal approach to promoting your brand. It allows you to develop relationships with your customers, which can help grow loyalty, and provides easily trackable analytics. It also provides a great, no-cost, way to share what you are doing for paid, earned and owned media. However, you can easily miss the mark without a clear understanding of the many social media platforms—Facebook, Twitter, LinkedIn, Instagram, YouTube and more. In addition, your social plan needs to keep pace as each platform continues to evolve. The best marketing strategies encompass all things media because each can effectively reinforce and bolster the other. Strategically placing your paid media in concert with earned news coverage and sharing it through your owned and social media channels is an art all its own. Let us help you paint a masterpiece.